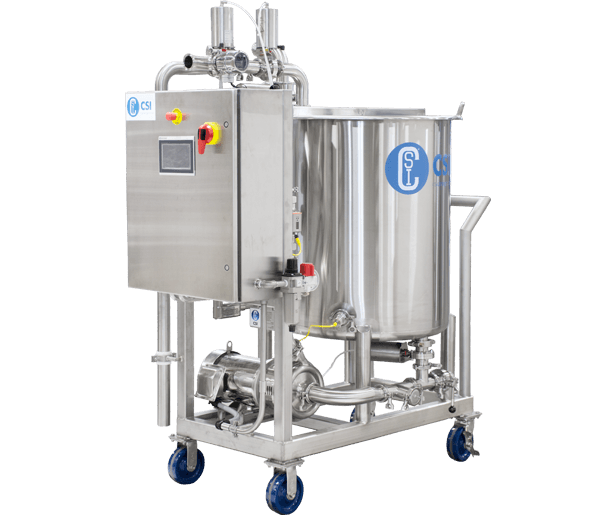 Compact CIP is a mobile, cost-effective clean-in-place (CIP) system designed to serve the needs of processors in the sanitary industry without compromising functionality or quality. The Compact CIP product line was originally conceived for customers new to CIP and for those with smaller budgets. With these customers in mind, mobility and versatility became key features. Compact CIP has large caster wheels and a small footprint, allowing it to be moved easily. Compact CIP is also a solution for well-established plants that want to expand their CIP capabilities, but do not want to commit to a hard-piped, centralized CIP system. Plants concerned with allergen crossover can dedicate individual Compact CIP skids to different areas of the plant, mitigating any potential for contamination. After over a year in development, Compact CIP was released as the most cost-effective CIP solution on the market. This system is built to the same level of hygienic design required for food and beverage industries. The instruments are robust and accurate, ensuring dependable measurements of temperature, flow, conductivity, and pressure. Flow is controlled via a VFD (Variable Frequency Drive) supplying power to the centrifugal pump. Compact CIP is a mobile unit that also serves as a fully functional, automated CIP system. The seven-inch touchscreen Human Machine Interface (HMI) displays the control interface. From this screen temperature, flow, concentration, and cycle time setpoints can be configured. A number of CIP washes can be selected after the parameters are established. With a touch of a button, the system will run the selected wash automatically, until each parameter is met and the wash is complete. These washes can be monitored, alarms can be viewed, and cycle trends displayed all from the HMI. The information is organized intuitively for quick operator training, configuration, and operation. Literature for Compact CIP have been saved to your dashboard! Literature for Compact CIP are already in your dashboard.